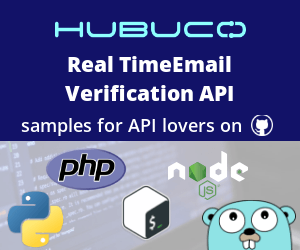 How to integrate HuBuCo's real time single API to verify emails as they subscribe. HuBuCo's Rocket Plan is specially designed for API users. Rocket Plan users get access to the World's fastest email verification API. You can verify an email in less than a second, and you can display the results in real time to your users / subscribers. You can change your plan at any time, as well as cancel without any cancellation fees. Read more about how our monthly plans work. How To Integrate HuBuCo's Real Time API? If you have not created a HuBuCo account, you can create one for free here: https://app.hubuco.com/register With our free account you can verify 100 emails for free every day. If you have a HuBuCo account you can find your API credentials on this page: https://app.hubuco.com/api You API key is unique, and you will use this to identify yourself during an API call. Example codes available on GitHub on how to use HuBuCo's real time api. A third variable is optional and is only available for Rocket Plan users. On the https://app.hubuco.com/api page you will find the above link and your api key. You will also find an example link, including your email address and your api key. If you click on the link, it open a new tab, and will verify your email address and show results in json format. How To Use The Results Provided? For each result you can find a result code. Using the result codes, it's the easiest to integrate our API. In real time email verification, I recommend, you can send emails to Ok, Catch All, Unknown emails, and in case there was a temporary error you can still accept that mail. Using HuBuCo's email verification system you can achieve 99%+ email delivery rate. You should never send an email to invalid or disposable email addresses. You can send email to those email addresses, that have a lower result code than 5.